I love board games and tabletop wargames, the problem is finding someone else who shares an interest in the hobby, and then finding the time to play against them. My wife is my only regular gaming partner, but, understandably, her tastes in theme are a bit more limited than mine. Tactical wargaming just isn’t her thing. Or on the flip side, it might be exactly her thing and bring out her extremely competitive side, getting me in trouble if my Sherman scored a lucky hit on her Tiger. Either way, it’s just not a good fit. That’s why I’m always excited when I hear about a good wargame going digital, now I too can get in on the fun. Tank on Tank, from Lock ‘n Load Publishing, is the latest such title to come to my attention. I had heard about the tabletop version several times in the past, and found it a tempting purchase. By all accounts it was a very accessible wargame with a limited scope, but a large fun factor. With the arrival of the digital version, I can play any time against the AI or go online to find a human opponent. The game features a long list of scenarios depicting armor and infantry fighting across the battlefields of Europe. 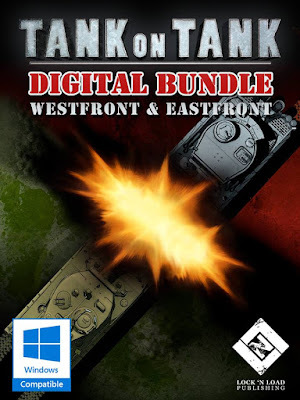 The “full” game bundle includes both East and West front action, but you can purchase just one front if you prefer. The units take the form of counters representing infantry, AT Guns, vehicles, and, of course, a wide array of tanks. These units move around relatively small hex-based maps trying to destroy each other and control objective locations. The scale is at a sort of abstract tactical level. It isn’t exactly clear how many units a counter represents, but it doesn’t really matter. All you need to know is that units have movement, range, and defense values, be aware of a couple twists for using them efficiently, understand how each turn works, all of which can be learned via a five minute read through the in-game manual, and you are good to go. That said, there is an intriguing amount of depth to how you use your units and their limited actions each turn. The limited actions each turn is really where the game forces some hard decisions on you, since you often get extra activations, in addition to the default two, but sometimes you don’t. You have to take a moment to consider what your highest priority is, since you might only be able to do one effective movement/attack on that turn. Grouping your units around HQ’s must be a part of your plans, since this lets you activate several units at once. On the flip side, concentrating your units together reduces your overall operational flexibility. Scenarios always have a limited number of turns, and multiple objectives, so when on the offensive you often need to cover a lot of ground in a hurry. Combat results in the game are calculated by rolling two six-sided dice, adding or subtracting some modifiers, and then comparing to the target’s defense value. Counters are either undamaged or completely destroyed by the result, as there are no “steps” to be found here. This can result in some very wild swings in luck at times. You might attack with four units at once and fail to knock out that pesky AT Gun, but then on your next turn you take a shot at it with a single counter and destroy it. One of my early battles was particularly frustrating, as I watched a lone enemy infantry unit knock out three of my tank counters, one after the other. Of course, it was my rookie leadership that left those tanks vulnerable to attack in the first place. One must approach this game with the proper mindset to get the most enjoyable result. This is not a game attempting to accurately depict WW2 combined arms warfare, this is a game that wants you to push some counter around a board and watch them blow each other up. Which isn’t to say that there is no strategy involved, since there are plenty of things you can do to increase your chances of winning. Just don’t go in looking for a game where careful positioning and realistic tactics will always win the day, since the dice might not be on your side that battle. If you take the game for what it is, you can have plenty of fun quickly playing a scenario or two or three, and you will find that the luck factor evens out over time. Replaying scenarios is encouraged by the individual high score charts for each one. Victory is determined by which side scores the most points, earned by controlling objectives and destroying enemy units. More than once I found myself immediately restarting a scenario that I just won, simply to see if I could win by a greater margin. This also reinforces the idea that this game is meant to be simple and fun. You can blaze through a scenario, making some mistakes, and then play it again and do better, all in one lunch sized gaming session. This makes Tank on Tank an ideal game for wargamers like me who usually have small windows for gaming each day. I can hop in, turn some tanks into smoldering wrecks, then get back to real life. I kept track of time while playing several scenarios in a row, and found that many could easily be played in less than ten minutes. Graphics and sound in Tank on Tank are relatively simple, but nicely done considering the transition from physical to digital. Tank counters throw up dust trails as their engines rev and the counter moves about, each attack features a shell being lobbed through the air and exploding, and air attacks are visualized by a fighter buzzing across the screen. There are snowflakes that fall on “snow” turns, a condition which also has important effects on the gameplay. The sound effects are all nicely done, with music that is pleasant and never distracting. The UI is clear and readily displays all of the information you need to play the game, with big buttons that are satisfying to click on, especially the fire button! The AI will give you a good fight in pretty much every scenario. Early on I found that it bested me repeatedly, but once I nailed down the game mechanics the battles tended to be close run wins more often than not. I actually watched what the AI did at times to figure out how best to play the game as I was learning the ropes. The relatively simple structure of the scenarios and combat mechanics means that if the AI does make a major mistake, it won’t hamper your fun at all. The game also features a multiplayer mode, where one can play out many of the same scenarios against a real live opponent. Unfortunately, I was never able to find a public match, despite waiting for an opponent to join my game for 30+ minutes as I wrote this review. It would be nice if there was some kind of indicator showing if anyone else was even in the multiplayer lobby. I can only assume the game would be great fun to play online, especially with friends. A recent patch added the ability to create your own scenarios and campaigns, if you digest everything the game has and want some additional variety. However, doing so will require an extra bit of dedication, since units and their initial positioning must be done by writing some lines of “code” in notepad. Nothing too difficult really, but don’t expect to just click the map in the game and add units. Perhaps that kind of functionality will be added in later. It does not seem that you can create or modify the actual maps in the game. It would be nice if you could do so, since there are only a limited number of maps available, and many are simple variations of just a few unique maps. I suppose these are the same maps available in the physical version of the game, but it seems a waste to not take advantage of going digital by offering a wider selection, or letting players create their own. Whether this game is worth your gaming dollars depends on what you are wanting it to be. For $40, one can get much meatier wargaming fare, but maybe meaty isn’t what you are looking for. If you are seeking a well polished game that lets you load it up and get into the action in a matter of mere seconds, then this could very well be worth the price. 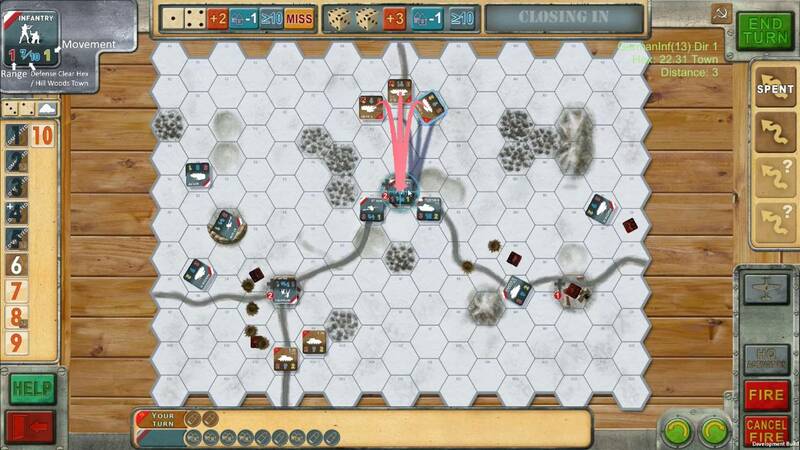 You can get your wargaming fix in fifteen minutes or less, no muss, no fuss. However, if you are averse to random rolls of the dice winning or losing a battle, steer clear. You will have the occasional match where absolutely nothing goes your way, despite making all the right decisions. This is a game that is meant to be quick, simple, and fun, and it succeeds in checking all of those boxes. I see myself playing bite sized bursts of this game for a long time. The icon is always there on the edge of my PC desktop, taunting me to go back for one more round. Great review that sums up all the qualities of this game and clearly tells you what to expect for your money. As a wargamer who's only played this ftf with the updated boxed game, you hit the nail on the head with the simplicity, but enjoyment value. I play few computer games, but this looks like one I'll be picking up soon. 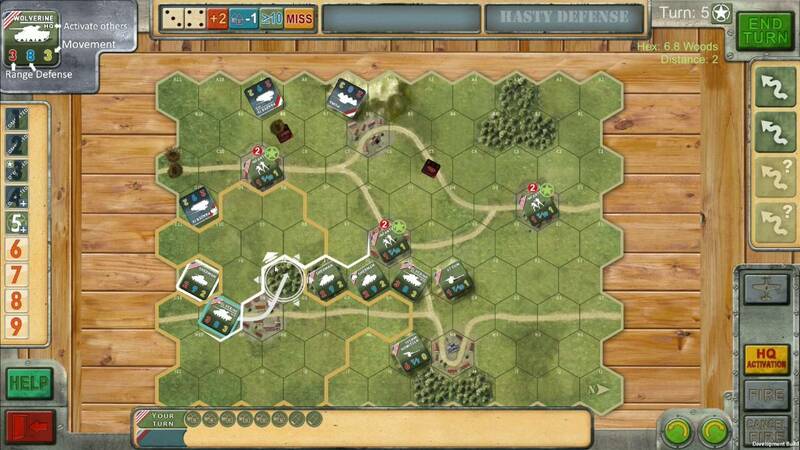 This is a quick playing fun WW II tactical & combined arms flavored tank game. The "fog of war" is there. Enjoyed your review. The AI can be challenging and great for practicing but the real thrill is playing an opponent online. Hope the word spreads about this enjoyable gem of a war game. The more the merrier. A well written review thank you very much.